After a successful “warmup” race meeting the previous weekend at rainy Donington Park and three days of testing this past week at Brands Hatch, both Team USA Scholarship racers Jake Craig and Colin Mullan felt well prepared as they headed into the British Racing & Sports Car Club’s 47th edition of the Formula Ford Festival at Brands Hatch last weekend. 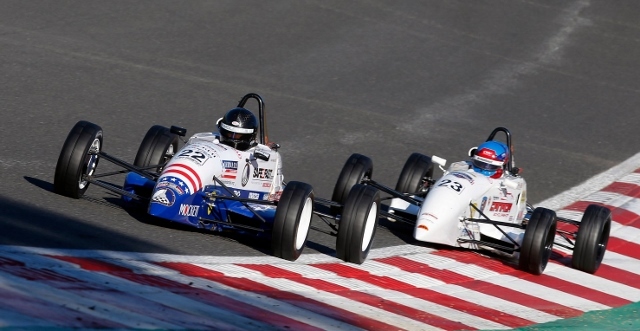 Craig, 20, from Mission Viejo, Calif., and Mullan, 16, from Danville, Calif., are the latest in a long line of talented young American drivers to take part in one of the most prestigious Formula Ford events of them all. The first-ever Formula Ford Festival was held at Snetterton in 1972, with future Formula 1 racer and Indy 500 champion Danny Sullivan among those competing for top honors. Four years later, in 1976, the event moved to Brands Hatch which has been its home ever since. Jimmy Vasser, as the inaugural Team USA Scholarship winner, was the first to represent the program at the Festival in 1990, while fellow Team USA driver Josef Newgarden, who went on to win the 2017 Verizon IndyCar Series title, became the first and so far only American winner of the event in 2008. 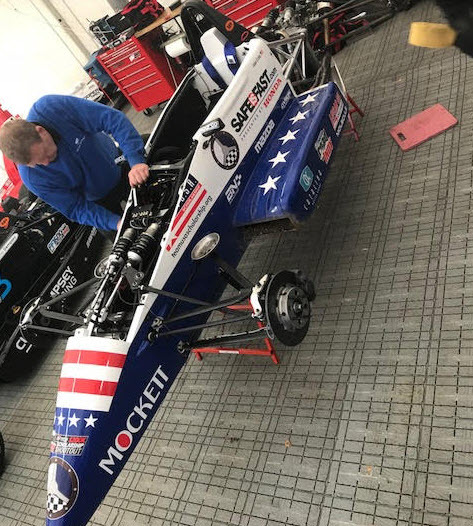 This year, as they have every year since, the pair of patriotically liveried Ray chassis will be fielded by Cliff Dempsey Racing. The famed “Indy Circuit” at Brands Hatch, some 30 miles southeast of London, is only 1.2 miles in length but with its variety of corners and characteristic elevation change will provide a stern challenge for over 70-plus competitors. “Brands Hatch is a phenomenal track,” said Craig, who had proved to be one of the fastest contenders in testing. “My favorite corner is definitely Turn One, Paddock Hill Bend, because of the huge elevation drop. “Testing at Brands Hatch has been going really well,” added Mullan. “Although the track is small, it has a lot of intricacies that are hard to get right each time. Having lots of practice has really helped us become more consistent and feel very prepared for the racing tomorrow. 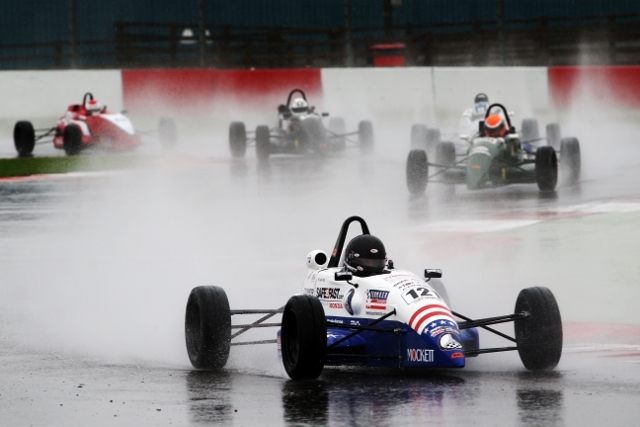 Picture-perfect weather conditions greeted the 70-car field for Formula Ford Festival, with Team USA Scholarship drivers Jake Craig and Colin Mullan displaying strong pace during this afternoon’s three Heat races at Brands Hatch. 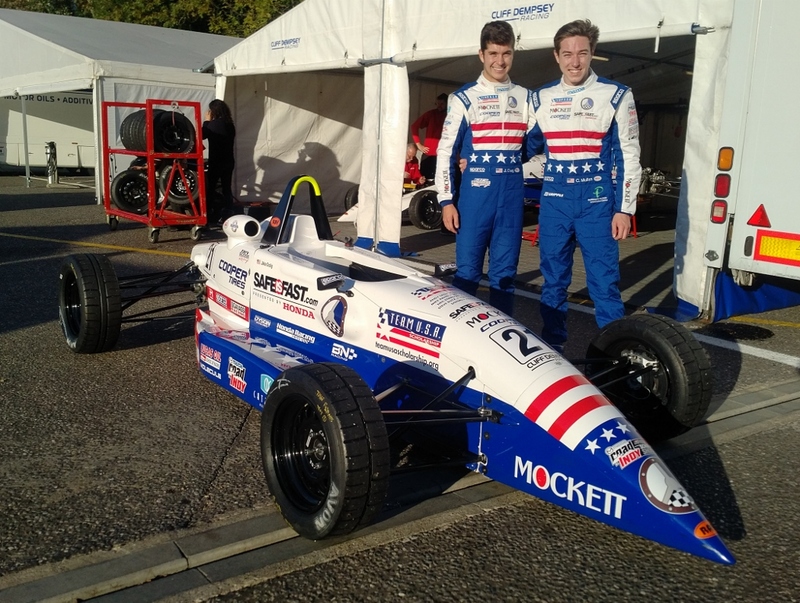 Craig led off the Team USA challenge by qualifying third for Heat Two at 50.526 seconds, merely two-hundredths of a second slower than pole-winning former Scottish Formula Ford champion Neil Maclennan. A good start saw Craig jump into second, whereupon he immediately began to pile the pressure on Maclennan. 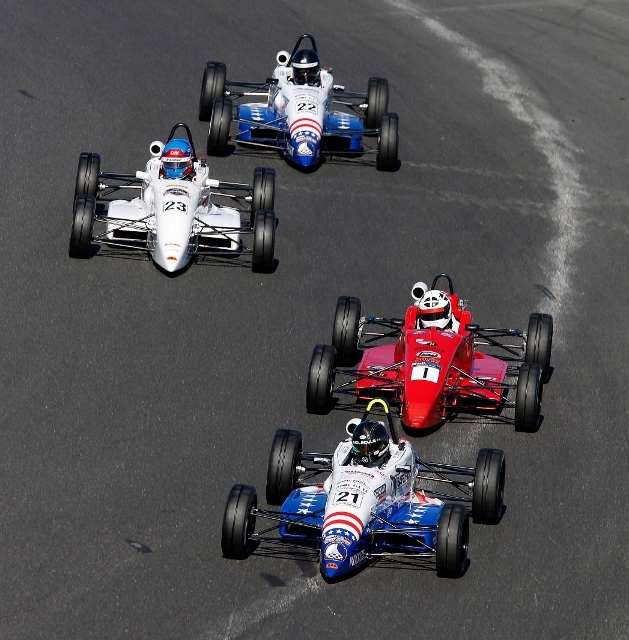 Craig, 20, from Mission Viejo, Calif., tried every which way to pass but the Scotsman was resolute in his defense, which allowed Englishmen Matt Cowley, the 2017 F1600 Championship Series winner, and fellow FF veteran Chris Middlehurst to join what quickly became a four-car battle for the lead. The unfortunate Craig found himself bundled down to fourth at the finish of an intense 15-lap race, although he made his point by posting the fastest lap at 50.761 seconds (an average speed of 85.66 mph). Mullan, 16, from Danville, Calif., was next up for Heat Three, which he started from the fourth position. His time of 50.407 was a scant two-thousandths slower than front row qualifier – and former Festival winner – Oliver White and the sixth fastest time overall on the day. Mullan made a good start but was unable to prevent last year’s Festival champion, Joey Foster, from finding a way past on the initial run up to Paddock Hill Bend. After five laps behind the Safety Car due to a trio of separate incidents on the first lap, Mullan settled into the battle but, as with Craig before him, was unable to make his way forward. He, too, showed excellent speed – his best lap of 50.740, set on Lap 11, remained as the fastest of the race until winner Michael Eastwell turned a fractionally quicker lap, 50.731, on the 15th and final lap. The respective best laps by Mullen and Craig ranked fourth and fifth overall during the Heat races, while their combined finishes, along with fourth for fellow Californian Carter Williams (a British FF regular this season) in Heat One, ranks Team USA fourth in the event’s World Cup element on 80 points, just five behind leaders England One. for Clearways. Craig continued his march forward with an identical maneuver to displace Foster one lap later. He moved up to fourth when early weekend pacesetter Michael Eastwell suffered a mechanical problem but then, as had been the case in his heat race, he became bottled up behind Neil Maclennan. The Scotsman staunchly defended his position which, with three laps to go, enabled Foster to regain fourth place when a couple of backmarkers also hindered Craig’s progress at Paddock Hill Bend. Craig eventually took the checkered flag in fifth, just ahead of Mullan, who had found a way past Archambault on Lap 10. Grid positions for the Final were determined by the finishing order of the two Semi Finals, with the respective winners, 2016 Champion Niall Murray, from Ireland, and Englishman Oliver White sharing the front row. Craig and Mullan lined up ninth and 11th. Both Team USA drivers had moved up a couple of positions inside the first two laps, whereupon the red flags flew as a result of three separate on-track incidents, one of which had seen fellow Californian Carter Williams spinning across Craig’s bows at Paddock Hill Bend. The race was restarted from the original grid positions, only for the Safety Car to be scrambled after one lap when Foster and Craig collided at Paddock Hill Bend while disputing seventh position. Both were eliminated with Foster’s car buried deep in the gravel and Craig pulling off at Druid’s with damaged suspension. A few laps later, the red flags were displayed again. With light fading, the race finally was shortened to eight laps, with the grid forming up for a third time in the order the cars had been running at the previous stoppage. As Murray, White and Englishman Joshua Smith waged a thrilling battle for the win, with Smith claiming a magnificent victory following a last-lap pass on Murray, Mullan was embroiled in a similarly fraught scrap for fourth. He finally took the checkered flag in eighth behind Matthew Cowley, Maclennan, Donegan and Archambault after overtaking Northern Ireland champion Matt Round-Garrido on the final lap. All six cars were blanketed by a little over one second. The program has been providing opportunities for talented American race car drivers at an early stage in their careers since 1990. Supporters include Doug Mockett & Company, the Road Racing Drivers Club and SAFEisFAST.com, Cooper Tire & Rubber Company, Team Penske, Mazda, Chip Ganassi Racing Teams, Honda Performance Development, Catalina Furniture, Robertson Racing, Lucas Oil School of Racing, PitFit Training, RaceCraft1, CXC Simulations, Sparco USA, RACER Magazine, Speedstar Management, Styled Aesthetic and Manifest Group. For more information, please visit www.TeamUSAScholarship.org or find us on Facebook or Twitter.